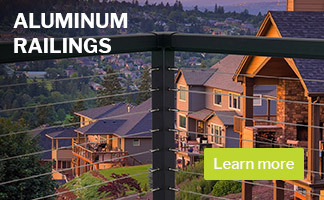 Vista Aluminum Railings come in 5 attractive style options – straight picket, wide picket or tempered glass, with finished railing heights of 36” or 42”. 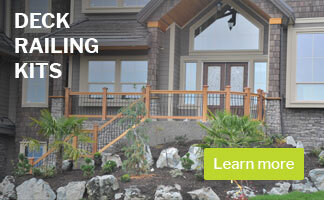 Vista straight picket railing uses 5/8” square pickets. 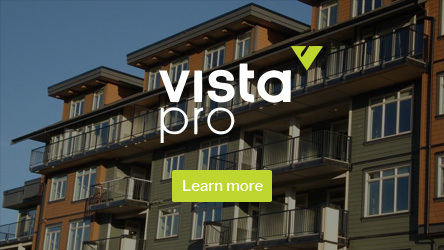 Vista wide picket railing uses 1-1/2” x 5/8” rectangular pickets. Vista glass railing uses 6mm (1/4”) tempered glass panels. Windwall railing is a 60” height system that uses 6mm (1/4”) tempered glass panels. Powder coated aluminium railing with stainless steel cable wire infill and hardware. Our cable railing is an innovative and stylish design and is amazingly simple to assemble. This product is considered ultra low-maintenance to help you spend more time enjoying the view!